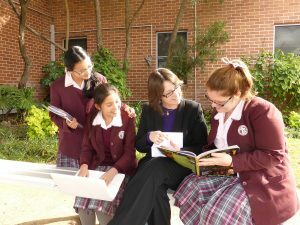 Sisters of Saint Joseph have a long association with education, as it was in schools that Mary MacKillop began her ministry. Josephites today are committed to providing people with the personal and communal resources necessary to live a full and rewarding life. We work throughout Australia and New Zealand and in specific areas of Ireland, Peru, East Timor and Brazil, in colleges, schools, parishes, community centres and universities, to nurture minds, hearts and spirits. ‘To nurture communion in relationships of compassion, justice, mutuality and healing as we engage in mission within the abundance and providence of God’. Sisters of Saint Joseph are currently involved in these different expressions of educational commitment.